I'm a big fan of sensory play. It's usually a little messy, but SO much fun! 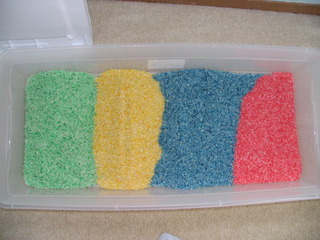 I found the idea of Rainbow Rice from Pinterest and new my daughters would love it. Add spoons, small cups, cars, etc.. This will provide hours of entertainment for your toddler or preschooler. Visit my other blog for some great giveaways! Art is very important for preschoolers. A Montessori classroom would have art supplies available for the children at all times. While I think this is ideal in a home setting with certain children this will not work. I tried to have lots of art supplies available for my daughter but it only resulted in a huge mess. Markers leaked on the floor, paint randomly on the wall or chairs, and play-do EVERYWHERE! So I had no choice but to put the art supplies out of reach for a while. I still had my art trays but I put them in a closet with a lock. When it was time for art I wold simply take the trays out so she had a choice of what she wanted to use but it was under supervision. Also hang art (at the child eye level) by famous artists along with art your child created. We did a fun and messy activity today with snow. Take some snow from outside and place it in a bowl. Have your child add a few drops of food coloring (put newspaper on the table first). Let the child add another color of food coloring. Mix it up to reveal what the 2 mixes colors make! Be sure to use old gloves or plastic bags to mix the colors together. Place grass, flowers, flower petals, rocks, twigs, acorns, crab apples, and any other spring related item you can find in a box. Place a blind fold on your preschool and ask him/her to reach into the box and feel an object. Have your child describe the object and guess what it is they are holding.